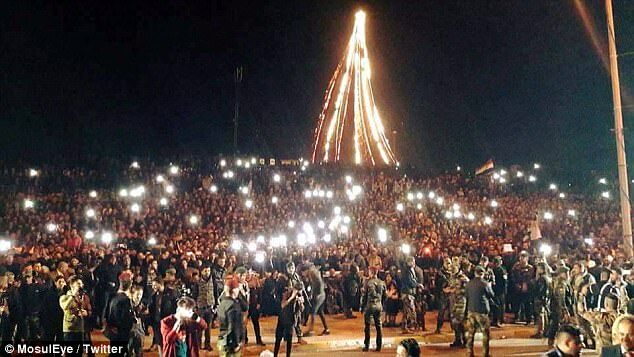 Mosul residents have enjoyed their first New Year's Eve celebration in years after being freed from ISIS rule. 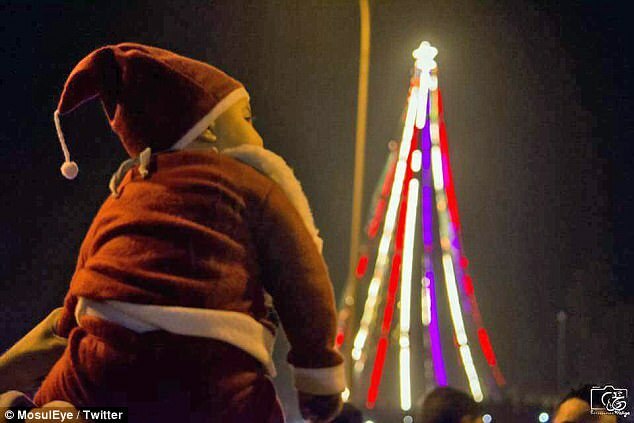 The jihadists seized the northern Iraqi city in 2014, barring such festivities and threatening severe punishment for anyone opposing their hardline regime. 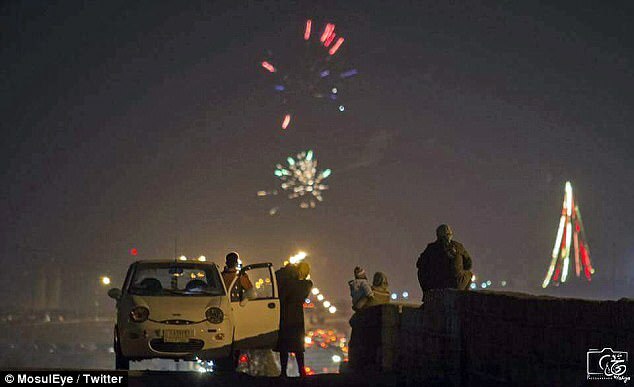 But last night, the sound of suicide bombs and gun fire had been replaced by colourful fireworks as citizens were finally able to celebrate the start of a new year. 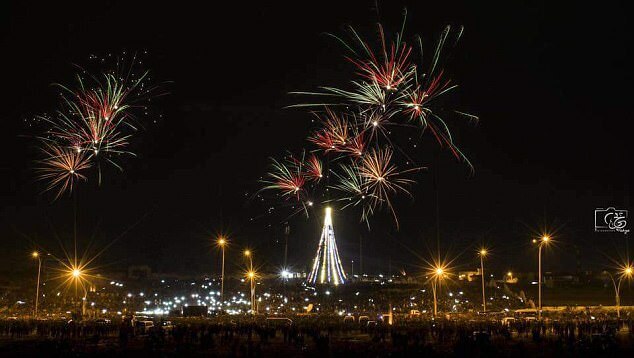 While the city centre was once used as an execution site by ISIS fanatics, pictures released by the Mosul Eye Twitter feed showed crowds of people on those same streets enjoying a spectacular December 31 display last night. The Iraqi Prime Minister celebrated victory in Mosul with his 'brave forces' in July. A 100,000-strong coalition of Iraqi government units, Kurdish Peshmerga fighters and Shi'ite militias had launched the offensive to recapture the city ten months earlier. But the victory came at an enormous cost: much of Iraq's second city in ruins, thousands dead and wounded, and nearly a million people forced from their homes. Enormous challenges lie ahead, not just in rebuilding Mosul but in tackling the continued presence elsewhere of ISIS. 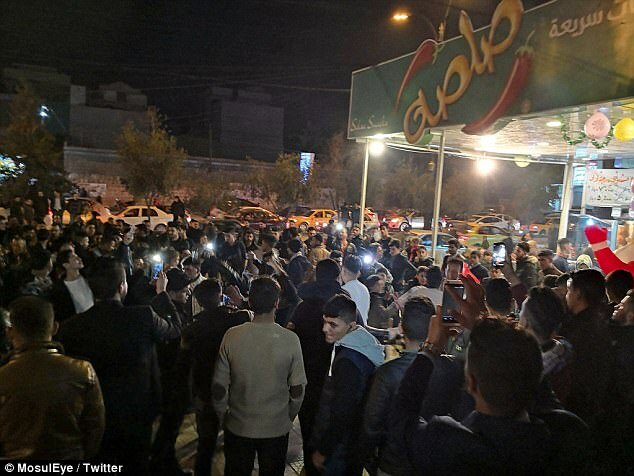 ISIS swept across much of Iraq's Sunni Arab heartland in a lightning offensive in mid-2014, proclaiming a 'caliphate' straddling Iraq and neighbouring Syria. Imposing its brutal interpretation of Islamic law, the group committed widespread atrocities and organised or inspired deadly attacks in Iraq, Syria and abroad. They have since been swept back with its other stronghold of Raqqa in Syria having also been recaptured last year. The anonymous blog Mosul Eye became a fascinating insight into life in the Iraqi city overtaken by ISIS in 2014. It revealed horrendous atrocities being committed by ISIS in the city of Mosul, from human rights abuses to beheadings. Some of his blogs, including those of a fatwa that all disabled children should be killed and Iraqi Army soldiers throwing ISIS fighters to their deaths after Mosul was liberated, became worldwide news. Historian and teacher Omar Mohammed, who is now safe in Europe, later revealed he was behind the Twitter account.